VGB LIVE 73: Weekend BANG! Goes Nuts! 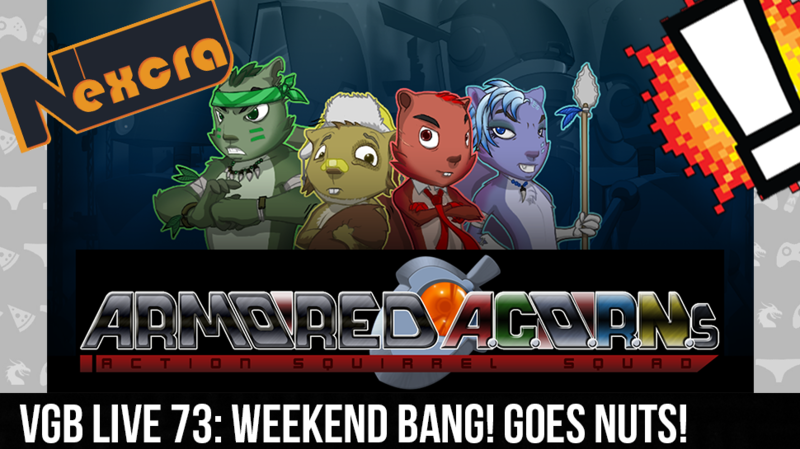 What’s up faithful listeners, this week’s episode of The Weekend BANG! is going to be nuts because we go the whole development staff from Nexcra Software. Sir Aaron Carter is at the helm with Cory behind the ones and twos, and The Real David Webb riding shotgun. We start off the show with a little Bangin’ Around the Web, where we give the people a little bit of advice to the male gamer on what games the ladies tend to like. We also discuss an indie title that has a new take on the horror genre. Closing out the show we get up close and personal with Sam Silva, Paul De Leon, and Justin Yamaguchi of Nexcra Software to learn all about their latest title Armored A.C.O.R.N.S. Will male gamers move towards games that female gamers play just to relate? Can a blind person survive in a haunted mansion? Will the Armored A.C.O.R.N.S be the next big hit on the Wii U? Find all that out and more on this week’s Weekend BANG!